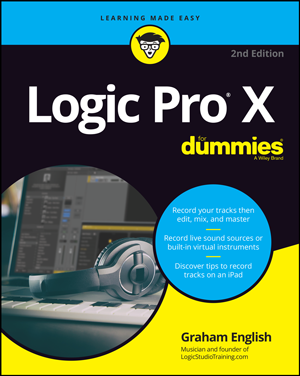 Free Video: Step-By-Step Logic Pro X! Free Logic Pro X Quick Start Video Guide. Learn how to use Logic Pro X in under 13 minutes. Enter your first name and email to watch! Graham – I don’t know what to say. I just watched Logic Pro X Quickstart and I feel I’ve learned more from that one tutorial than all the videos I’ve been watching from others for months. Clear, concise and expert – exactly what I needed! Thank you! The Quick Start provides clear, concise overview of Logic Pro X, drawing attention to important new features in this version yet serving to inform and excite the new user. Well done. Our Logic Pro training gets you back to creating music in far less time. No searching through crappy YouTube tutorials. No frustrating troubleshooting while your inspiration nosedives. It is CLEAR. CONCISE. EVERY single tutorial has taught me something. Within minutes of signing up, I had the answers I needed. And if they don’t have them; they’ll get them for you. The customer service blew my mind. They actual Logic Studio Training dude shot me back an e-mail and helped me out. Amazed. NO ONE else does that. Graham English. I think that he’s the perfect teacher, I’ve bought Logic lessons across the web, but Graham is the best of the bunch. The quality of teaching that you get here for the price that you pay is astounding in itself. I’ll never use another Logic training site again. Logic Studio Training is simply the best one out there. For those that are sitting on the fence about joining, my advice is to jump right in! Keep up the good work Graham! It is very easy to get started with, the videos are of good quality, and watching a few videos always gets me inspired and in the mood to play around with my logic and home studio gear. The videos are great, the screenshots are detailed, and the teachers are knowledgeable. Still using Logic Pro 9? Get the Free Logic Pro 9 Cheat Sheet. Get on our list and you’ll sound better. That’s our promise to you.